protect yourself from existing liabilities. Includes more than two dozen crucial forms, including sales agreements and promisory notes. See below for a full product description and a list of forms. If you’re ready to buy a business, it’s essential that you protect your interests and get the best deal possible—and with The Complete Guide to Buying a Business on your side, you will. The 4th edition of The Complete Guide to Buying a Business is completely updated to reflect the latest laws and tax rules. Will You Need to Hire Lawyers, Accountants, or Other Professionals? Which Kind of Buyer Are You? 5. What's the Business Worth? Alot of people talk about buying a business, but relatively few actually take the steps necessary to make it happen. By consulting this book, you’ve taken the first step: learning about how the process works. This could be the beginning of an exciting and profitable adventure. If you’ve already decided to buy a business, you’re probably anxious to get on with it. That’s fine. Skim or skip this chapter and move on to Chapter 2. If, like many readers, your goal in buying a business is to earn a living working for yourself, you may be motivated by the opportunity to turn your back on being an employee and answering to a boss. But be forewarned: Independence does come at a price. By buying a business, you may be signing on for longer hours and more worries than you’ve ever experienced as a hired hand. Then again, if the business succeeds, the financial and personal rewards are yours to savor. And of course, when you own your own business, no one can fire you. For many entrepreneurs, money may be a significant motivator, but it’s not necessarily the most important. The simple joy of shaping an enterprise—almost always a creative endeavor—may stimulate your efforts far beyond the promise of financial independence. Not everyone who wants to buy a business should. You need to consider carefully whether it will actually work for you. Many businesses fail or run marginal operations. How do you avoid that and become one of the winners instead? One way to be sure that you want to go ahead, and increase your chances of success, is to spend some time working in the industry you might enter. So, for example, if you think you want to open a restaurant, get a job working in one and learn the ropes. You’ll see just how difficult it is—and, possibly, realize that it is exactly where you want to be—without taking on the risks right away. And it may be that you’ll decide that it’s not for you, and that it’s better to save your nest egg and get a part-time job that will bring you less stress, less risk, and less heartbreak if you don’t succeed. In this chapter, you’ll learn that not all buyers are cut from the same cloth; a number of different motivations and personality traits can lead someone to consider entrepreneurship. You’ll see where you fall in the range of people who consider buying a business—and people who actually do become business owners. And you’ll discover that if you decide owning a business is for you, buying an existing one is a great way to do it. You also have the options of starting a business from scratch or buying a franchise, and we’ll discuss those options in this chapter. Each of these paths to business ownership has good and not-so-good features—but for many would-be entrepreneurs, buying a business is clearly the best choice. • I can’t afford a promising business. • I may pay too much. • The business may fail and I’ll lose all that I have. • The seller may conceal crucial information. • Business trends will change and hurt the business I’m interested in. • I’ll have to work too hard—or I’ll get bored—and then I’ll have trouble selling the business. • The sales agreement will contain tricky clauses that will lead to my financial ruin. • The sales agreement will omit clauses that could protect me. • Professional fees will add greatly to my costs. • I’ll wind up paying more income tax than I anticipated. These are all important issues to consider, but you needn’t lose sleep over them. This book will provide realistic information to help you deal with all these worries. Which Kind of Buyer Are You? People who think about buying a business tend to fall into the three basic categories described in this section. But while different buyers’ needs and goals aren’t the same, the process of buying a business—especially the legal procedures—is surprisingly constant. So whichever category you fit into, you can use this book as a roadmap to guide you through the entire transaction. Let’s look at the three types of buyers. Many people buy a business where they intend to work each day, with the expectation that the business will provide a steady source of income. In a typical scenario, the buyer makes a down payment of between 10% and 25% of the sale price. Then, as the new owner, the buyer pays the seller the balance of the sale price in monthly installments spread over a number of years. The buyer, of course, will have other bills to pay each month—including rent, employee paychecks, utilities, insurance, and business taxes. Whatever is left over is income to the owner—though many business owners wisely keep some money in reserve to help them ride out slow periods. Example: Tired of working for someone else, Andy looks for and finds an attractive antique furniture store to buy. He’s especially pleased that the business has built a loyal following in the community over a 15-year period. Andy plans to quit his job and run the business, which he believes will generate enough income to support him and his wife, Judy. He agrees to buy the business for $150,000. The seller is willing to accept a $30,000 down payment. Andy agrees to pay the balance—together with interest at a 6% annual rate—in 60 monthly payments of $2,320 each. Two years after buying the business, Andy is confident he made the right decision. He thoroughly enjoys talking antiques with his customers, and he looks forward to the buying trips that he and Judy take twice a year to replenish their inventory. Each month, after paying the seller, the landlord, and two employees, Andy is able to pay himself $6,000—and he knows that because of his hard work, he’ll be able to sell the business some day at a handsome profit. Andy, of course, could have tried to get a bank loan to buy an inventory of antiques and start a business from scratch. But he felt it was less risky to buy the existing business and get the benefit of the goodwill that the owner had built up over the years. He also liked the fact the business had an ideal location under a long-term lease that he could take over. Some people who buy a business are already in business and want to expand their current enterprise—both to increase their business and possibly to dominate a local market. Such people are often called strategic buyers because they’re carrying out a larger business strategy. Some of those who are looking to expand a business may be in the market for the same kind of business they’re already in. There are enormous advantages to this, the biggest one being that the buyer already knows a great deal about the business and can value it appropriately at purchase and operate it more easily after the purchase is complete. Example: Emma owns a delivery service that primarily serves the east side of town. If she had a few more trucks and drivers, she could greatly expand her clientele and serve the entire city. She approaches Phil, a competitor who is reaching retirement age. They agree on terms that will let Emma expand by buying Phil’s business. Emma will not only buy the additional trucks and drivers but will also benefit from the goodwill that Phil has built up over the years through consistently providing timely pick-ups and deliveries. She’ll also protect herself from competitors who might have expanded in the same way had she not done so first. As frosting on the cake, Phil agrees to stay on for 90 days as a consultant so that the transition will go smoothly. Others looking to expand an existing business may be seeking something that’s not a mirror image of their existing business but would neatly dovetail with it. Example: Ernie and Paulette run a popular guitar studio. They realize there’s a cap on how much they can earn by giving lessons, because there are just so many hours in the day. At a meeting of music educators, they hear a rumor that a guitar and drum store in a high-traffic shopping mall may be up for sale. They investigate and find that the rumor is true. Ernie and Paulette check out the facilities and discover to their delight that not only does the store deal in name-brand instruments but there is ample space in the premises to install four soundproof instruction rooms. They do the math and decide they’ve come upon an opportunity to greatly expand their income while continuing to work in a field they love. Some people buy a small business simply as a way to round out their portfolios. Example: Doris is convinced of the wisdom of having diversified investments. She already owns stocks, bonds, money-market funds, and real estate, including two small apartment buildings. Some of her investments—like the bonds—are relatively conservative. Others—like some of her high-tech stocks—are more speculative. For additional balance in her portfolio, Doris feels she’d like to buy a small business that can be run by a full-time manager. Because she believes that small businesses are more risky than most of her other investments, she’s hoping to find a business that’s likely to return at least 15% annually on the money she pays for it. This strategy, of course, is only available to folks with significant assets and the ability to bear the risk. If you decide you’d like to own a business, buying an existing one isn’t the only way to accomplish your goal. You could, instead, start a business from scratch or buy a nationally branded franchise. As you’ll see below, each of these options has its own pros and cons. For many would-be entrepreneurs, buying an existing nonfranchise business is the most attractive alternative. But this isn’t always true, and it’s important to consider all of your options before making such an important investment. Whatever type of business you’d like to own—retail, service, manufacturing, or product distributorship—you always have the option of starting with a clean slate and creating a brand-new enterprise to your exact specifications. Here are some considerations to be weighed in assessing this option. Relatively low cost. You can typically start a business for less than it would cost to buy one. If the business you’re thinking of buying is the least bit profitable, the seller will want money for goodwill: the intangible value that goes beyond the worth of the basic business assets. It represents, for example, the value of a loyal customer base and perhaps a good reputation in the marketplace. By contrast, when you start a business from scratch, not only do you avoid paying for goodwill, but you can assemble the exact assets you think you’ll need. Goodwill is almost always overvalued, at least by the seller—for example, if you take on a popular restaurant but your food doesn’t measure up to what customers are used to, loyalty will disappear pretty quickly. By contrast, a new restaurant with great food will generate buzz (and its own goodwill) pretty quickly—and you won’t have paid for the existing customer base. The joy of creation. You have the satisfaction of starting from scratch and making the business exactly what you want it to be. The business will have your personality indelibly imprinted in it. And if the business prospers, you’ll feel the warm glow of pride. Control. You’ll be the only one to make decisions about how to start and run your business. You won’t be obligated to stick with the practices of your predecessor or toe the line for a franchisor. Greater risk. Plunging into the great unknown carries greater risk than buying an existing business that has a good track record. At the beginning, you’ll be engaging in an experiment to determine if your concept will work. And even if customers flock to your new enterprise, you’ll have to deal with loads of issues such as pricing, hiring employees, setting up business systems, and so on, that would already have been addressed if you bought a going concern. Difficulty of raising funds. You may have a hard time finding a bank or other lender to give you the funds you need for a business start-up. Lenders are often leery of brand-new enterprises. Guesswork in making decisions. You’ll need to make important business decisions without experience of your own, or the benefit of an existing business structure and possibly even the wisdom of the former owner. For example, how should you price your goods or services? What type of inventory should you maintain? What type of advertising will best support your business? This is the flip side of the positive element of having total control; being responsible for all the decisions means that you must figure everything out yourself. No existing base of loyal customers or clients. You’ll need to find ways to let people know you’re around. Then you’ll have to painstakingly convert them to loyal customers or clients who not only return to you time and again for your goods or services, but also tell others about you—the best way build your business. No immediate cash flow. Since you have no ready-made base of customers or clients, it can take time for money to start coming in. And because you may be inexperienced at establishing systems, collecting debts, and managing inventory, it can take an even longer period for the business to start generating a profit. Finding a suitable location. If location is important to your brand-new business—for example, if you need to be in a high-visibility, high-traffic location—you’ll have to spend time and exert effort in finding just the right place to rent. Then comes the chore of negotiating a favorable lease, and possibly the expense of renovating the premises to suit your needs. If there’s an existing business that has made a cheap or offbeat location work, you’ll probably find this impossible to replicate. No systems in place. You’ll have to set up bookkeeping and accounting systems. How difficult this is will depend on your experience and comfort with tasks like this. Even though excellent software is available to help you do this yourself with at most a little bit of professional help, it can be a time-draining diversion from running the business. No employees in place. Unless you’re going to be a one-person show, you’ll have to find and train competent employees, which can be a more demanding task than you might imagine. Hooking up with suppliers. With no established relationships, you’ll need to seek out reliable and cost-effective suppliers. Even though the list of negatives might seem long, through hard work and good fortune, you might find that starting a business from scratch will come closer to meeting your needs than the other means of becoming a business owner. Many people get started in business by buying a franchise from a franchisor. Some of these people are able to make a go of it, but others find the experience to be frustrating, disappointing, and even financially disastrous. In large part, this is because most franchises are overpriced when you figure in all the ongoing fees and costs. For most people who plan to own a business, the franchise route is probably the most problematic. But like the other methods of ownership, there are positive and negative factors for you to weigh. Name recognition. A well-run franchisor—using its own money plus advertising fees from franchisees—can pour money into regional and national advertising to help consumers become familiar with the brand name. By becoming a franchisee, you get the benefit of this advertising. If the name has a good reputation, you begin to benefit it from the very first day you open your doors for business. A precise plan for doing business. Typically, the franchisor will provide you with training and an operations manual. The franchisor will probably help you find a suitable location and order the necessary equipment. And if you’re working with a good franchise, you can often count on the franchisor to offer advice if you run into a jam. Credit is available. Franchisors frequently let you pay the bulk of start-up costs over a period of years, making it unnecessary for you to turn to a bank or other lender for money. Territorial protection. You may have exclusive rights to a franchised business within a defined geographical area. But increasingly, territorial protections are nonexistent. Lots of franchises are junk. Tens of thousands of different franchises are currently for sale. Many of these have little or no name recognition, high fees, and poor prospects. Starting a similar business on your own would be far cheaper and offer better chances of success. Relatively high costs. Franchisors take money from you in many, many ways, often making it very difficult for owners of even well-known franchises to turn a decent profit. In addition to the basic fee to buy the franchise, you may have to pay the franchisor for required equipment and supplies and for a portion of the advertising pool. Also, you may have to send the franchisor a healthy share of your gross income each month. Franchise fees can often add up to more than 10% of the business’s gross monthly income. Very little flexibility. If you buy a franchise, you wind up marching to someone else’s drummer. To the franchisor, it’s the franchise way or the highway. If you don’t mind taking orders about every detail of the business, being a franchisee may work out fine for you. But many entrepreneurs are independent types who bristle at the regimentation that often goes along with being a franchisee. Long-term contracts. Buying a franchise almost always means signing a long-term contract in which every clause is tilted strongly in favor of the franchisor. Rarely are you able to negotiate more equitable terms. The franchise contract generally is offered on a take-it-or-leave-it basis. Hard to escape. If the business doesn’t live up to your expectations, it can be difficult to simply walk away, even if you’re willing to give up the money invested so far. Not only is it likely that you’ll have continuing financial obligations to the franchisor, but selling the business to someone else will be easier said than done. There may be few takers. And even if you find someone who is interested, that person may not be acceptable to the franchisor—who probably has reserved the right to approve or disapprove any sale of a franchise and to make changes in the franchise contract that might make it less desirable to a new buyer. Given all these factors, it’s a good idea to think twice before signing up for the cost and inflexibility of a franchise. Do your homework. Before signing up for a franchise, get a copy of the proposed franchise agreement and review it carefully. If there are parts you don’t understand completely, consult a lawyer. Also, contact a number of current franchisees and find out what they think of working with the franchisor you are considering. All of this information is crucial for your decision making. Buying an existing business has its own set of positive and negative features. But you, like many others, may find that on balance, it’s a desirable approach—and a goal you can attain with the help of this book. No need to reinvent the wheel. An existing business has a history—a track record—so you can tell whether the concept is sound and profitable. Immediate cash flow. Acquiring a healthy business usually means there’s money flowing in right from the get-go. In the best-case scenario these funds will cover your expenses and leave enough to pay you for your time and effort in running the business. Seller financing. You probably won’t have to scrounge around for funds, other than for the down payment and a modest cash reserve. That’s because most small business sellers will let you pay the bulk of the sale price over a period of three to five years. An existing location. The business may have an established location that’s protected by a favorable lease for several years. If so, you can continue operating from the same place. You won’t have to reeducate customers about where to find the business, and you won’t have to mount a search for suitable quarters. Expert assistance. Many times, the seller will agree to stick around as an employee or consultant to help you learn the nuances of the business and make the transition easier. And if the seller isn’t willing to help out for more than a month or two, you can probably still count on the help of long-time employees who will stay, giving you the benefit of their experience and knowledge. In short, if the transition is correctly managed, you won’t be all alone with a new enterprise. Contracts with suppliers and vendors. The business may have ongoing relationships and contracts with suppliers and vendors—perhaps on favorable terms. Often, you’ll be able to benefit from such contracts and not have to form new relationships, which can be a time-consuming ordeal. Reduced risk of business failure. Statistics show that established businesses are much less likely to fail than businesses started from scratch. Using someone else’s concept. When you pay a substantial sum for an existing business, you are by definition putting a high value on someone else’s business concept. It follows that some of the thrill of creating something on your own will be missing. But it’s also true that you’ll be free to introduce your own good ideas to the already-successful business model over time. Or, put another way, you’ll have plenty of chances to make a good business better. Relatively high cost. Typically, to get the benefits of buying an existing business, you’ll need to pay something beyond the value of the business assets: an intangible called goodwill. You can look at this as the price you pay to reduce the risks inherent in a start-up. It’s also the seller’s reward for building a successful business. In business as everywhere else, there’s no free lunch. Possibility of hidden problems. The vast majority of business owners, including those looking to sell their businesses, are honest people. Especially if you patiently and diligently investigate all aspects of the business, the chances are excellent that you’ll receive enough solid information to sensibly evaluate its prospects. Still, there’s always the possibility that a shady seller will distort or withhold key facts. By following the suggestions in this book and consulting knowledgeable professionals before you buy, you can greatly diminish—but not eliminate—the chances of getting stung by a seller’s dishonesty. Because you are reading this book, you already believe that buying a business is an attractive option. The benefits listed above probably give you more reason to consider it. Before we get into all the details, here are five basic principles that can help you buy a sound business at a decent price—and become a happy and prosperous business owner. Understand all the steps in the purchase process. That’s what this book is all about: making sure you’ve engaged in a thorough consideration of the practical and legal steps necessary to find and buy an existing business. Armed with this information, you can confidently take action on all aspects of buying a business, such as finding one that fits your needs, figuring out what it’s worth, negotiating the price and payment terms, structuring the deal so as to save on taxes and protect your legal rights, and finding and using professionals to provide advice and review key documents. And you can also avoid the many pitfalls that are all too likely to trip up the naïve or poorly informed buyer. Know yourself. If you’ve never owned a business before, you need to think about whether you’re temperamentally suited to be a business owner. Are you able to tolerate risk? Deal with the unexpected? Work long and possibly erratic hours? Manage employees? Make important decisions quickly? If any of these things don’t sound like you, maybe buying any business isn’t the right course of action for you. At the same time, there’s no reason to exaggerate the risks of owning a business. As you well know, working for someone is hardly ever risk-free. Companies fold or downsize. Benefits are cut. Working conditions change. So total security is an elusive goal. Because owning a business opens up the possibility of greater personal and financial growth than you can normally expect as someone else’s employee, this risk can be well worth taking. Be patient. At each stage of the purchase process, you want time on your side. Finding the right business to buy can take many months—or even a year or longer. If you try to rush the process, you’ll almost surely end up buying a substandard business or paying too much for a good one. And even after you’ve found the business of your dreams, you still face the meticulous work of investigating the business thoroughly and then negotiating the terms of your purchase. You can’t accomplish these crucial chores overnight. Again, if you act impulsively and without adequate preparation, you are likely to make costly mistakes. Budget wisely. You want to avoid the discomfort of extreme financial pressures that can lead to bad business decisions and cause hardship for you and your family. So you need to think carefully not just about the purchase price but also about the payment terms. You’ll probably wind up buying a business on an installment basis, making monthly payments to the seller. Of course, you’d like to keep the down payment as low as possible. But because a relatively low down payment will mean relatively high monthly payments, this isn’t always the best course. Will you be able to make the payments month after month, pay all the other expenses of doing business, and wind up with enough left over to provide adequate income for your family? To give yourself a little cushion, it’s best not to sink every last penny into the business—even if that means purchasing a less-ambitious enterprise. What happens if you encounter unexpected expenses? Or if the business goes through a slow patch? Or a lawsuit or other unexpected problem adds to your expenses? You need to keep some money in reserve to ride out such periods. Understand the limits of professional advice. Using this book, you should be able to personally handle much of the work involved in buying a business, but you may also need or want some professional help. For example, you may want to have an accountant look over the financial records of the business or offer tax-planning advice. Or you may want to have a lawyer draft or review the important legal documents (like the sales agreement and closing papers) that are part of every business purchase. This book alerts you to the times when professional advice can be especially helpful and explains how to work with lawyers and accountants on a cost-effective basis. But we will also remind you that there are limits to the kinds of advice the experts can offer. Most important, no expert—however experienced or well-intentioned—can make the decision on whether you should or shouldn’t buy a specific business. That’s your call and yours alone. That’s not to say you should be a know-it-all. Many factors other than legal and financial concerns can and should influence your decision. You can often gain helpful insight by talking things through with your spouse or domestic partner—or perhaps a friend or relative who has owned a successful business. To buy a business on attractive terms, you must thoroughly understand and aggressively deal with a myriad of practical and financial details. To offer just a few examples, you must decide on the type of business you’d like to buy, find the business that will meet your needs, investigate its current situation and future prospects, come up with a workable plan to pay for it, and negotiate a sales agreement. And of course, each of these big steps has numerous smaller steps within it. Understandably, if you’ve never bought a business before, thinking about all these tasks may feel overwhelming. But don’t worry: Each one of these steps, and more, can be sensibly understood and dealt with when taken one at a time. That’s where this book comes in. 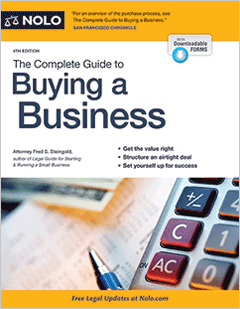 In the chapters that lie ahead, we’ll take you through all the crucial details of the business-buying process. But before we delve into these many details, let’s devote this section to understanding the big picture. No matter how eager you are to buy a business, you need to first take stock of your overall financial picture. Your enthusiasm for becoming a business owner can quickly turn into misery if you get in over your head. So plan to deal with dollar-and-cents realities right from the start. The most likely scenario is that you’ll buy a business on an installment basis. Typically, you’ll make a substantial down payment to the seller and then pay the balance in monthly installments over a number of years. So, you first need to figure out where you’ll get the down payment. Let’s say you plan to take it from savings. Are you prepared to put every last cent of your savings into the business? That’s probably a bad idea. It’s far better to keep a comfortable reserve so you can deal with emergency expenses and not be forced to search frantically for money to meet unexpected bills. If instead of raiding your savings for the down payment you plan to borrow the money, you must also use caution. Remember that you’ll need to pay back the lender—and you may be making these payments at the same time you’re making monthly installment payments to the seller. Where will all this money come from? Looking beyond the down payment and the installment payments, you’ll need to expect the unexpected: business expenses that perversely seem to crop up in periods when business income is at a low ebb. How will you deal with such expenses? Will you wind up even deeper in debt? You also need to be clear on whether you’re counting on the business to produce profits that you can use to pay for personal expenses: the mortgage on your home, the lease payments on your new car, the weekly grocery bills. If there’s a second earner in your household, you’re getting income checks from a trust fund, or you have substantial savings, this won’t be a problem. But if you’re expecting your business to immediately give you the wherewithal to cover personal living expenses each month, you need to consider the possibility that income from the business won’t be as substantial as you think it will be. If you’re young and have no dependents and little or no debt, you can afford to take on more risk. But if loved ones are looking to you to bring home the bacon, you need to be a lot more cautious. This can translate into buying a less-expensive business, while keeping open the option of trading up to something grander when you’re in a stronger financial position. Perhaps you’re not accustomed to thinking in broad financial terms. In that case, it can pay to talk matters over with an accountant—preferably one who thinks conservatively. As an entrepreneur, you can’t afford to be wholly averse to risk. But you do need a dose of financial realism to prevent you from putting yourself into a painful financial bind. The most time-consuming and frustrating part of buying a business may be your search for the right business to buy. Not that there’s shortage of businesses on the market. In fact, it’s likely that you will find many businesses up for sale that broadly fit your criteria. The key is to understand exactly what type of business you’re looking for and then find an excellent one. Be patient. You can quickly buy a bad or merely average business. Buying an excellent one takes more time. It may take you a year or two of active searching to find a business with excellent prospects that you really want to own. So don’t get discouraged if an attractive business doesn’t pop up on your radar right away. And above all, don’t let your own impatience cause you to make a poor decision. In searching for a business to buy, it’s essential to know early in the game what you want. You have surely heard the saying, “If you don’t know where you’re going, you probably won’t get there.” The business-buying corollary goes like this: If you don’t know what you’re looking for, you probably won’t find it. You may already have a very clear idea of exactly the business you want. Especially if you’ve worked in the field for an extended period, you may even be able to describe it in detail. But if you’re pretty sure that you want to buy a business but don’t know what type, you’ll need to narrow it down and then weigh the positive and negative features of the types of businesses that you might consider buying. For starters, here are some questions to consider. Are you mainly interested in owning a retail business, a service business, a distributorship, or a light manufacturing business? Each has its pros and cons. But on balance, well-designed service businesses often offer the best prospects of success, because it‘s usually easier to start or purchase them for a reasonable amount, and, once in operation, it’s easier to establish and maintain robust profit margins. What types of products or services are on your short list? Within the retail field, you may prefer dealing with food rather than bicycles, or vice versa. In the service arena, you may be interested in acquiring a landscaping business rather than a company that installs computer networks. Trust your intuition here. Only you can know what types of enterprises will fit you like a glove and which will feel like a handcuff. What kinds of businesses would be a good match for your skills and experience and would give you pleasure? For example, if you’re an avid sailor, you might be looking for a harborside business that sells, rents, and services small sailboats. Helping new sailors get started or an experienced one enjoy his or her hobby may be both financially and emotionally rewarding. Or, if you majored in art history and are an amateur artist, owning a workshop catering to amateur and professional local artists, complete with classes and exhibit space, might be right up your alley. Try for a niche that fits your personality and skills. But don’t let your attraction to a particular activity, be it birds, bicycles, or begonias, drive all your decision making. You still need to find a business that is, or can quickly become, a profitable one. Many people are attracted to retail or food service businesses—stores and restaurants, in particular. But the reality is that some service businesses (teaching teenagers to pass SAT exams, for example) have profit margins approaching 100% because they have almost no overhead. By contrast, many retail businesses reap almost no profits after overhead. In short, it’s sometimes better to be the plumber than to sell tubs and showers. Is physical location an issue? For any number of reasons, you may want to continue living in your current community. For example, your spouse may not want to give up his or her good job, or perhaps you’re active in local civic affairs or have deep roots in your town. By contrast, if you’re more flexible and can move anywhere in the country or perhaps anywhere within a certain region, this obviously will open up many more business possibilities. Figure this out first, and then you can narrow or broaden your search accordingly. Realistically, how much can you afford to invest? It’s important to start with a tight estimate of how much you can comfortably invest in a business. Still, because most businesses are bought largely or at least substantially on credit, you may be able to afford a bigger business than you might think. For example, to take over a $200,000 business, you may be able make a 10% down payment ($20,000) and pay the balance in installments over a five-year period using the profits the business generates. On the other hand, you don’t want to use every last cent of your savings. Keep something in reserve in case the business hits a rough patch. Once you’ve thought through and answered these questions, you’ll be in good position to start looking. In Chapter 4, you’ll find practical suggestions for conducting your search. Even when you find a business that appears to have the right ingredients, you’ll want to learn as much as possible about its history before making a commitment to buy it. Start by examining preliminary financial data from the seller—tax returns and balance sheets, for example—and then, if the business has some real possibilities, dig deeper. At that point, especially if you’ve never owned a business before, you might consider hiring a CPA or small business consultant to help you crunch and understand the numbers. Chapters 4 and 5 have suggestions for investigating a business in depth, and Chapter 6 explains how to find and work with professionals. In 1901, when Andrew Carnegie offered to sell his huge steel operations to J.P. Morgan, Morgan immediately asked, “How much?” Carnegie promptly picked up a napkin and wrote “$480 million” (perhaps $10 billion in today’s dollars). Morgan said yes and the sale was made. Wow! How efficient. Unfortunately, a quick agreement to a number written on a napkin won’t be a good approach for you. In fact, chances are that before you get too far down the road in your discussions with the seller, you will need to devote a considerable amount of time and thought to the value of any business that you’re considering buying. And this is true even if you think that you already have a ballpark idea of what the business is worth—either from your own experience in similar businesses, from talking to others in the industry, or from articles you’ve read in trade publications. Unless you’ve worked in a managerial capacity for the specific business you’re considering, your seat-of-the-pants notion of the business’s value may be wide of the mark. At the very least, you’ll want to refine it based on a convincing method that you can use later in your negotiations with the seller. If possible, it’s advantageous to have a sense of what the business is worth before you even begin negotiating with the seller. That way, you’ll know whether the price the owner has set is in a range that you’d even consider. If the seller has set the price way too high, you may decide that the gap between what you think the business is worth and what the seller thinks is simply too great to justify your spending more time in negotiations. Similarly, if you haven’t done your homework and your opening offer is much lower than the low end of the business’s value, the seller may not take you to be a serious buyer, and you may lose a good opportunity for the wrong reasons. Valuing a business is both an art and a science. As you’ll learn in Chapter 5, there are several textbook methods you can use: valuing the assets, basing the price on comparable sales, calculating return on investment, or using an industry formula based on sales or units. Whatever valuation approach you employ (and it’s more likely you’ll combine approaches), you’ll probably end up with a range of values rather than one absolute number. And while it’s essential to be able to defend the price that you offer to pay, in the last analysis, the number you name won’t be nearly as meaningful as the one a willing seller agrees to accept. When you find a likely business, even if you and the seller seem to come to a quick and enthusiastic meeting of the minds, there will be plenty of chances for the deal to fall apart as the details are worked out. For one thing, you’ll be digging deeper into the business and learning more about what can be dozens of nitty-gritty operating issues. In addition, you’ll be making sure you don’t inadvertently assume liability for hidden problems, including lawsuits, toxics, and tax issues. Because you’ll probably want to pay the sale price in installments, you’ll also need to convince the seller that you’re creditworthy and have the necessary entrepreneurial skills and personal attributes to make a success of the purchase. • Structure of the sale. Will you be buying the business entity (the partnership, corporation, or LLC) or just its assets? • Assets being transferred. Will the seller keep some assets that are currently part of the business—accounts receivable, for example, or high-tech equipment? • Payment terms. You probably won’t pay the full purchase price in cash up front. But how much will you put down? And what payment terms and interest rate will the seller agree to? • Seller protection. What kind of security interest will you give the seller to protect the seller if you stop making payments? For example, will you agree to give the seller a lien on your home as well as the business assets? • Buyer protection. If the seller misrepresents some important details about the business or fails to take care of existing business debts as promised, what legal recourse will you have to unwind the deal or get fair compensation? • Seller warranties. What warranties will the seller make about the condition of the business or its assets? For example, will the seller guarantee that no environmental hazards lurk within the business premises? If hazards are found, will the seller be able to pay the cost of the clean-up? • Buyer warranties. What warranties will you make? For example, until the seller has been paid off, will you be asked to agree to keep the business equipment in good shape, to maintain the inventory at presale levels, and to continue to operate from the existing location? • Liabilities. How will you and the seller handle current business debts? Will responsibility for some current debts (and even potential lawsuits) be transferred to you? Or will the seller agree to stay liable for all presale obligations? And on the flip side, will you be adequately protected from future debts and lawsuits? • Ongoing connection to the business. Will the seller perform any services for the business in the future? If so, for how long, and how will the seller be compensated? Will the seller be an employee or an independent contractor? • Ability to compete. Will the seller be allowed to immediately invest in, own, or work for a similar business? If the seller will be restricted, how stringent will the restrictions be, and how long will they last? Obviously, if the seller is very elderly or ill, or is planning a move out of the area, this won’t be a major issue. Conversely if the seller wants to stay active in a similar business or perhaps even sell just part of the enterprise, negotiating right-to-compete issues will be a crucial part of striking a deal. These are all questions that will be very important in your negotiations, and this is just an outline. Later chapters provide the information and forms you need to negotiate the deal: Chapter 2 provides an overview of the legal issues. Chapters 8 (“Structuring Your Purchase”), 9 (“The Investigation Stage”), and 10 (“Drafting a Letter of Intent”) will help you work toward a sales agreement. The most important legal document used in the purchase of a business is a sales agreement. Correctly drafted, this legal contract should capture all the details of the sale. This, in turn, allows the seller to transfer the business entity or its assets to you smoothly on a specified date (called the closing). And if a dispute arises before or after the closing, the clear terms of your sales agreement will be the first place you’ll look in an effort to resolve it. Because the sales agreement is so crucial in the sale of your business, Part 3 of this book—Chapters 11 through 17—is devoted to a clause-by-clause analysis of the sample agreement we provide. Part 4 (Chapters 18 through 20) covers other important sales documents, including promissory notes. But before you draft and sign a sales agreement and related documents, it’s essential that you carefully read the intervening chapters so that you understand the legal and practical import of every term and are sure that nothing significant has been left out. After the sales agreement is signed, there’s one more step before the business is actually transferred to you. This takes place at a meeting (called the closing) at which you pay the sale price, or at least the agreed-upon down payment, and sign documents such as a promissory note and security agreement. In exchange, the seller signs stock certificates or LLC documents (if an entity sale), or a bill of sale for the business assets (if an asset sale), plus all the other paperwork needed to turn ownership over to you. Chapter 21 provides details on the closing, including how to prepare for it and handle any last-minute problems that may occur. The checklist below reiterates the main steps in buying a business. The rest of the book follows up on each of those major steps and gives you the details that will help you make the right purchase at the right price. Determine the kind of business you’re looking for. Figure out what the business is worth—or perhaps a range of reasonable values. Create and sign a sales agreement. We hope you enjoyed this sample chapter!